Most of us have forgotten our email password at some point. Fortunately online email providers like Yahoo,Gmail,Outlook.com provide convenient password recovery options. These password recovery options all rely on you having previously configured a recovery method. The most common recovery method is to use an alternative email address. 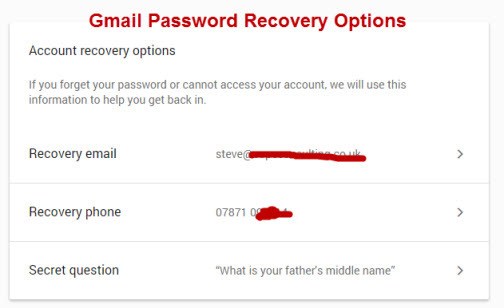 One of the most important things you need to do with your email account is to setup password or account recovery options. You should find this as part of your account settings. Here are the Google Gmail options which you access through your account properties>sign-in and security. Notice you can also use a recovery phone number as well as an email address. Because people change mobile phone numbers and stop using email accounts it often occurs that the recovery information is out of date and thus effectively useless. Most people don’t realise that the Google chrome and firefox web browsers store remembered password in clear text. Because most people access their email using a browser, and most people will have asked the browser to remember the password this is a very useful recovery technique. 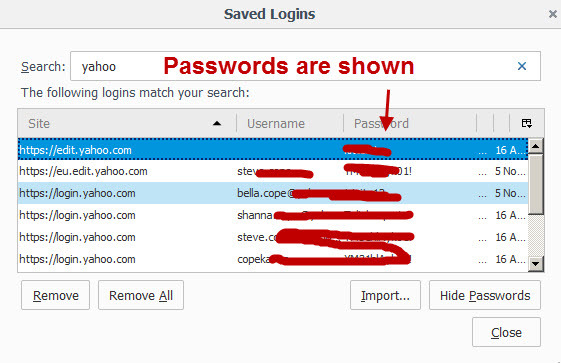 As an example suppose you have forgotten your Yahoo email password and you have been using Firefox to access your email. A window opens with a list of saved sites. Use the search function to locate yahoo sites. 4. Click show passwords and click OK in the confirmation box. The passwords are shown in the window. Here is a video that takes you through both methods. It is important not only to choose a strong password but also to take precautions to ensure that you can recover from a forgotten password. 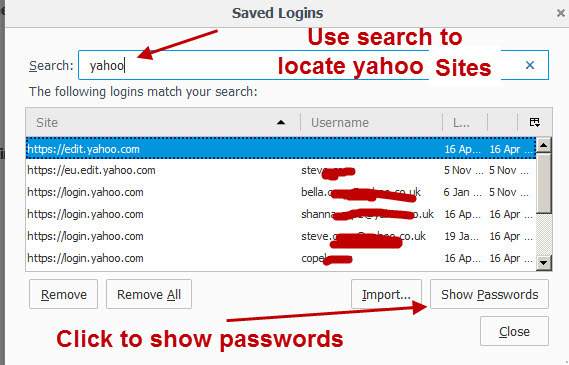 If you use Google Chrome or Firefox then they offer an easy way of finding forgotten passwords. There are also many password recovery tools available for recovering passwords from email clients like outlook etc. The free mailpass view recovery tool from nirsoft.net can recover password from a variety of email clients. Simple methods for creating secure Passwords.